It is a pleasure to once again be invited to address the National Press Club in Canberra. In our discussion today I want to present an overview of Papua New Guinea’s expanding role in the region. 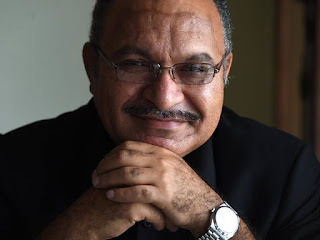 Considering the global challenges facing commodity producing nations it is important to understand where Papua New Guinea is today given those challenges before us. We live in a region of great opportunity, and Papua New Guinea is placed ideally in this region between the nations in Asia and the Pacific. That is why we believe strongly that regional economic integration is delivering real benefits for our people and empowering communities around the Asia-Pacific. Over the past four years, Papua New Guinea has been able to achieve a great deal and improve standards of living for many Papua New Guineans. As a Member of the Pacific Islands Forum we have also been able to work closely with our partners in advancing Pacific Regionalism and moving towards a road map for sustainable development in our communities. We have been able to manage meaningful relationships with our neighbours particularly in terms of sensitive issues. Our position in the region places us in a good position to host APEC in 2018. The APEC Leader’s summit, will be held in Port Moresby, will be truly a Pacific Summit in terms of style. We are engaging more deeply with Members of the APEC community. As a developing nation in the region we have a lot to learn from that engagement. I acknowledge the support we receive from Australia and New Zealand for helping Papua New Guinea to strengthen its engagement in the Pacific and with APEC economies. We have an evolving relationship between our two countries. The focus of our relationship is not only aid dependent but is moving more towards trade and investment between our two countries. We are seeing greater two way investment between our countries. We are seeing more people to people exchange and tourists coming to our country from Australia. This year alone we are seeing more than 90 cruise ships visiting our country from Australia. These numbers will only increase over time. At a Government to Government level our relationship is in a better position and taking on important new dimensions. We are reforming the way we engage between our two countries, particularly in the engagement of Australians who are working in Papua New Guinea. Recently we have now restructured the way Australians work in providing technical advice and building technical capacity in our public service. We want the Australians to be a part of our public service machinery - not merely consultants. An example of this reform is that recently NEC appointed an experienced Australian Assistant Police Commissioner, Mr Alan Scott, to be our third Deputy Commissioner in the Papua New Guinea police. He will be sworn in very shortly. These are some of the opportunities that are available for Australians if you want to work and live in Papua New Guinea. We believe strongly that building capacity and directly being involved in the public service machinery in Papua New Guinea is the way forward in working with Australia. There are many challenges facing Papua New Guinea today and there will be challenges tomorrow. Like any emerging economy exporting nation we are facing global challenges particularly from the lower commodity prices. I do not want to sugar coat the pressures that we are facing with our people. We have an open dialogue on what we are doing to confront these challenges. The serious decline in world prices for our oil and gas and our minerals over the last 12 to 18 months has had a serious impact on our economy. The Australian economy faces similar challenges. In Papua New Guinea - just a couple of years ago - royalties and taxes from the resource sector totaled close to two billion Kina. Last year it amounted to just 260 million Kina - barely one eighth of the previous year’s revenues, and we expect the same in 2016. As a result we have to revise our budget estimates downwards and live within the new normal. We are deliberately running a deficit budget because we are committed to the promises we have made to our people. Our debt level is manageable - about 35 per cent of our GDP. Our government had to make tough decisions while making sure that Government itself is held responsible for those decisions. That is an approach that is well accepted by our citizens. We have cut spending and we have done so in a careful way that ensures the delivery of basic services. The delivery of these services to our communities is at the very heart of the policy agenda for our Government. We were overwhelmingly elected in 2012 because of the commitments that we made to the nation. Our key promises of free education which is ensuring that all children in Papua New Guinea attend school. Our commitment to free basic health care particularly for our rural majority. Improving law and order and reducing the impact of crime on families and especially on women and children. Building and restoring vital economic infrastructure such as roads, ports and airports which is continuing to enable the growth of our economy. So over the past four years we have delivered on those promises. Today there are now more than one million additional children attending school than there were just 4 years ago. Today there are medicines going to the most remote parts of our country. As a result of this our kids are growing up in a better environment. This is bringing about generational change with enormous implications for our community. Now more children than ever will grow up with an education. Some will go on to university to become doctors and engineers. The vast majority others, having spent years learning to read and write and to do maths, will give them to have better opportunities in their lifetime. These opportunities were never available to their parents. They will be more capable and more meaningful contributors to our economy. This has been one of our Government’s most significant achievements. We are also delivering in the area of healthcare, and more people are surviving from illness and disease than ever before. There is an enormous amount of work to do to expand universal healthcare. We are working with our development partners including the Australian AusAID program as one of them, churches and NGO groups like YWAM, young Australian medical students who are helping communities throughout Papua New Guinea. This is keeping families together and it is making them stronger and becoming a more harmonious society. It is improving quality of live and addressing critical areas such as high infant mortality. In the law and order our streets are safer today. For the first time in a decade we have trained and graduated new police men and women. When Parliament sits later this month we will introduce more reforms in how we police services to our communities. We will restore chains of command and improve police discipline. We will have a one-strike and you are out policy for police who break the rules. Our judiciary is now being properly funded for the first time in many decades. This is improving our courts system helping clear the backlog of cases that have been building for many, many years. Finally, we are investing significantly in infrastructure. In four years we have been able to change infrastructure standards in our economy that had been in decline for many, many years. We are upgrading and expanding our hospitals, our schools, our roads, and airports. These had never been maintained and now they are being maintained. The improvements being made to infrastructure are helping make our export industries more competitive and more productive. That is one of the lessons we have to learn from the downturn in commodity prices. I know that the commodity exports in Papua New Guinea are struggling like in many countries facing similar challenges - but we have to learn from this and Papua New Guinea is no different. As we prepare for a return to higher commodity prices at some stage in the future we must invest in other areas of the economy. Today we are empowering our local communities. We are decentralising our Government systems. By doing so we are allowing communities to take ownership of decisions that they make. We are now reinvesting in areas like agriculture and tourism, small and medium enterprises that are going to be able to sustain the economy into the future when we experience downturns in commodity prices. This is empowering local communities and it will obviously change the lives of people. Bringing government to the level closest to the people we are enabling our rural majority to have a say in where their country is going. The implementation of this policy is now well advanced. Only two weeks ago we had our Leader’s Summit in Port Moresby where we had reports from the remotest parts of the country - where our services are being delivered in healthcare and education and in infrastructure. We heard how it is changing their communities because the Government’s policy is enabling them and resourcing them. I am confident the future of Papua New Guinea is very bright. We will continue to build a harmonious society and we will learn from the challenges that we have today by diversifying our economic base. That does not mean that we will neglect our resource sector. Our oil and gas and the mines remain a vital part of our economic structure in the development of our country. Today we continue to work with the industry in ensuring that we have a stable environment in which they can invest. We are now working closely to open a few new world class projects in Papua New Guinea. That includes the second PNG LNG project after the successful delivery of the first LNG project that was on time and within budget. We have a low cost structure that is enabling large investors like TOTAL that is preparing for a new 19 billion dollar project that will employ thousands of Papua New Guineans. We are also looking at an investment in the expansion of the first LNG project through the P’nyang field which will further expand our LNG exports. We are also expanding our mineral sector. The Wafi-Golpu project is a world-class project with rich deposits. Our Frieda River gold and copper project which is online now. These are the projects of world class standing that is giving confidence that the Papua New Guinea economy is heading in the right direction. These projects will employ thousands of people, they will improve the standard of living for our people, enable benefits for thousands of landowners and propel our country into the future. One thing that has been noticed over the past fourteen years is that Papua New Guinea has had only two Governments in that time. We are able to for the first time in the history of our country have true political stability in our country. This is enabling confidence in the business sector. As a result we are able to have policy stability giving our public service to be coordinated towards a common goal. Today I am proud to say that we have more than 90 Members of the 110 Members of Parliament who are in Government. They are continuing to maintain the stability that will take us to the elections in 2017. This is serving our nation well unlike in the past when there used to be self-serving interests. Now our country is able to make decisions that can be implemented fully in the best interests of our nation. Another challenge that faces us in the region, that faces Papua New Guinea, is the environment. In Papua New Guinea we have just witnessed the worst impacts of climate change. Rising sea levels and tidal surges in many parts of our country, we have a devastating drought and frost, as well as extreme storms. Already our people in some island villages are becoming refugees and are resettling on the mainland. Drought that has destroyed crops has left many of our people without food but we have been able to manage those issues by ourselves. That is why there has not been much media attention of the worst drought ever to hit our people. We have been able to manage it because of our ability to engage with our communities, and our Government’s commitment to serve our people over that period of time. Only last week Fiji felt the full force and destruction caused by Cyclone Winston and not so long ago Cyclone Pam devastated Vanuatu. This is not normal weather but weather made worse by climate change and global warming. Our communities in the Pacific are some of the most exposed in the world who are most vulnerable to climate change. We attended the global climate change talks in Paris in December last year. The outcomes was probably as good as we could have expected from that meeting but we should not be limiting ourselves to that agreement. We must be able to do more. Australia, New Zealand and Papua New Guinea have an obligation to the rest of the Pacific. We must make sure that vulnerable communities and their ways of life are protected. We must make sure that they can protect their infrastructure and that services can still be delivered. That is our moral obligation and I know, as I speak here today, that we have a Pacific islands community that is needing our help. We must stand up for them. Finally, I just also want to talk about corporate Australia and the responsibilities that they also have. Papua New Guinea is one of the top destinations for Australian business - but again the environment is an issue. Big companies must recognise that they have big responsibilities. We have recently opened Ok Tedi following a shutdown period. Years ago that was the subject of a major environmental disaster, operated by BHP at that time. The compensation arrangements that were put in place to safeguard the communities are being mismanaged today. This is not the sort of corporate responsibility that we expect in an emerging country like Papua New Guinea. BHP, as well as other mining companies that operate in Papua New Guinea, must take responsibility of the environmental damage done to our communities. Where they lack clean drinking water, where new diseases have been introduced, we must make sure that we attend to these problems. Today Ok Tedi has changed. The Papua New Guinea Government has taken over the mine and we are rebuilding the communities. We are rebuilding the communities and we are working with the landowners and the local governments in having a partnership that is going to serve all stakeholders. I believe strongly that if we work together we will ensure that these issues do not happen again. I know that under the leadership of Managing Director of Ok Tedi, Peter Graham, an outstanding international executive who had previously delivered the PNG-LNG project, we are changing the way we do business. We make no apology for taking a firm stance on this issue. We have an obligation to our people, their well-being is our number one priority. We need to ensure that there is a right balance in ensuring that our people and their interests are protected. I want to conclude by saying this. We are very positive about the future of Papua New Guinea. Papua New Guinea is a great country, a very unique country, with more than 825 languages and thousands of ethnic groupings. It is a country of many people all within one nation. It is also a country that is going somewhere. Despite the global challenges that we have, the future is even brighter. We have political stability. We have certainty about our country going forward. Our economic fundamentals are stable. We have the right fiscal policies that will enable the growth of our economy. Our debt levels are manageable. We have a responsible spending program for our Government. Our policy focus is people focused. I know that we can continue to improve living standards, continue to improve the infrastructure that business will need to expand their business and their opportunities in our country. We want to make sure that we attract quality foreign investment into our country. I look forward to answering many of your questions here today.